Professional-quality cake balls are relatively easy to create, if you follow these simple steps. We have attempted many different methods to make cake balls, but we keep coming back to these tried-and-true steps to create tasty and beautiful cake balls each and every time. First, all cake balls must start with cake. So, the first step is to bake a cake. Use a store-bought mix, your favorite recipe, or try one of these recipes for red velvet, Devil's food, carrot or vanilla cake. After the cake has baked, remove it from the oven and slice it into four quarters. This will help it cool faster, and will give you sections to pick up for crumbling. After the cake has cooled to room temperature, pick up each of the four sections and crumble it into a large mixing bowl using your hands. Continue to crumble the cake until you no longer see any chunks. Next, you will combine the icing with the crumbled cake. Follow the instructions for making the icing and then add it to the bowl. The best way to mix it in is to just use a wooden spoon and some old-fashioned elbow grease. You will need to give the cake and icing mixture a good stir until it is fully combined and has a doughlike consistency. To create a consistent size for your cake balls, we recommend using a cookie scoop to portion out equal amounts of cake ball dough. We think a good size for a cake ball is about 11/4 inches in diameter. It is the perfect size to balance the ratio of cake to icing to chocolate coating. We like to scoop out all the portions before we start rolling. Now you can start rolling. Take each portion that you’ve scooped out and roll it back and forth between your hands until you have a nice smooth ball. Place each ball on a tray lined with parchment or waxed paper. After you have rolled all of the scooped-out portions, place the entire tray of balls in the freezer for at least 2 hours. Before you take your cake balls out of the freezer, you’ll need to prepare the dipping chocolate. Warm your chocolate using your preferred melting method. Remove your cake balls from the freezer and spear each ball with a toothpick. 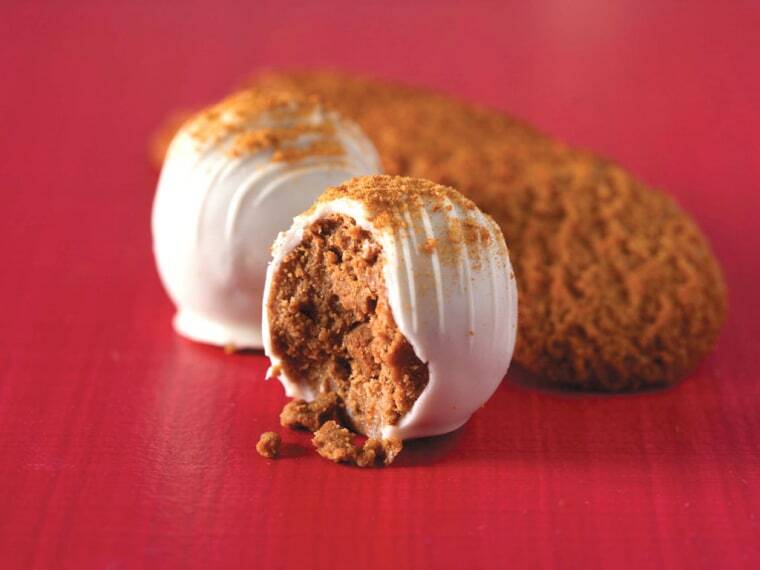 Pick up a cake ball by the toothpick and dip it in the melted chocolate. Be sure to coat the entire ball. Then, lift the ball above the chocolate and give it a light shake to let the excess chocolate drip off. Set the dipped cake ball back down on the waxed paper and move to the next cake ball. Continue to dip each cake ball until all of them are complete. You’ll now remove all the toothpicks and “cap.” Using a spoon, take a small amount of the melted chocolate and cover the small holes where the toothpicks were. You can now decorate the dipped cake balls according to the recipe or your imagination! Reprinted with permission fromCAKE BALLS © 2012 by Robin Ankeny and Charlotte Lyon, Running Press, a member of the Perseus Books Group.